Sacred Traces | The Reverend Dr.
We did not actually go to that particular church, although we visited some others. I no longer know what it means to say that a place is “spiritual” anymore – the term has become so threadbare from overuse – but this tiny island country absolutely qualifies. In the past, travelling to foreign countries, I’ve been a fiend for church visits: to grand churches, tiny churches, old churches, new churches, lavish churches, spare churches, tumble-down churches, and churches under construction. In Iceland, it’s even possible to find underground churches that have been carved out of the hillsides; sod roofs helped to trap in the warmth. But it’s also possible to follow in the footprints of countless churches that once stood on the land and then vanished. Iceland is terra nova, without question. Large swaths of it are uninhabitable and whole tracts lie under lava fields. The country is subject to earthquakes and volcanic eruptions; the winters span most of the calendar year, right up until arrival of the Midnight Sun in summer. Life there is hard. This country that is terribly subject to the elements is also quite religious; in fact, it is the most religious Western democracy besides the United States. Roughly four-fifths of Icelanders identify as members of the Lutheran Church, since true to Scandinavian form, people there prefer to have their allegiances standardized. Before the Lutherans, though, there were monks. Ahead of the Vikings, even, the Irish monks arrived, seeking the kind of peace and quiet they could not find on their side of the Atlantic, where the world was already getting old and weary and overcrowded. At the start of the eighth century, they came sailing in search of “ultima thule” at earth’s outer reaches. For reasons that still remain a bit mysterious, those monks did not stay. But by the eleventh century, Iceland had its own bishopric and center for theological study in Skalholt. If you go there today, in the spot that has served as a church center for almost a millennium, you will come across a church built only 50 years ago. The prior one was destroyed by earthquake, and several others previous to that were lost to fire. In the Skalholt church basement are gathered some ancient headstones for the theologians buried on the church grounds. A couple of these are marked with the distinct iconography of an hourglass sitting atop a skull. Momento mori. Remember, please, that all living things must someday die. So in this place where the ground itself feels alive, threatened extinction also feels palpable and seems to shape the native religious sentiment. Nothing lasts forever – that could either be the start of profound wisdom or foolish fatalism, your pick. “People with second sight have known for a long time that some places are more susceptible to spiritual presences than others,” Noble Prize winner Halldor Laxness writes in his novel, Under the Glacier. “Iceland was one of the spheres for this special presence; people knew this even in the Middle Ages, while hell was in Iceland… in the elements themselves, places where fire has become earth, earth become water, water become air, and air become spirit.” In Laxness’ homeland, you are more likely to encounter sacred traces on shifting ground than to encounter sacred spaces still housed in solid structures. One day near the end of our trip, we took a ferry from Reykjavik to an abandoned island where a thriving monastery had stood for centuries. Today there is no remnant of it, just a thick mist that shrouds the paths trod by generations of practicing mystics. We got lost among them before turning back to shore. Not too far from the small landing dock is a tiny wooden church, the second oldest surviving church building in Iceland, which was consecrated in 1774. It offers rather modest salute to all those thousands of houses of worship that did not survive the years, those places where people had gathered time and again for worship and thanksgiving. The spiritual seekers and pilgrim people who sojourned to the remotest spots on earth had grave reason to doubt whether they themselves would survive, but they had few doubts about the impermanence of their institutions. Yet they formed communities and built together nevertheless. A mentor of mine, the late Reverend Dr. Forrest Church, often stated that our religious impulse arises from the dual reality of our knowing that we are alive and our recognizing that we eventually die. Iceland happens to provide an incredibly dramatic backdrop to that. Each autumn, the trees along our particular stretch of the Hudson River illustrate much the same point for us with local poignancy. The world is indeed our cathedral. With bittersweet fall, the seasons turn with such pageantry; the foliage thins; the chill creeps in; the year begins to draw to its close, never to pass our way again. Its allure is potent and soulful. As we feel the earth continuing to spin, we can sense how close all our lives lie to the edge of existence, and something nips at us. Just consider that this something might be as much friend as it is foe. It may be natural for us to follow where it leads – a sort of humbling holy pursuit, and entirely worth our while, travelling where so many nameless, traceless others have gone before us. 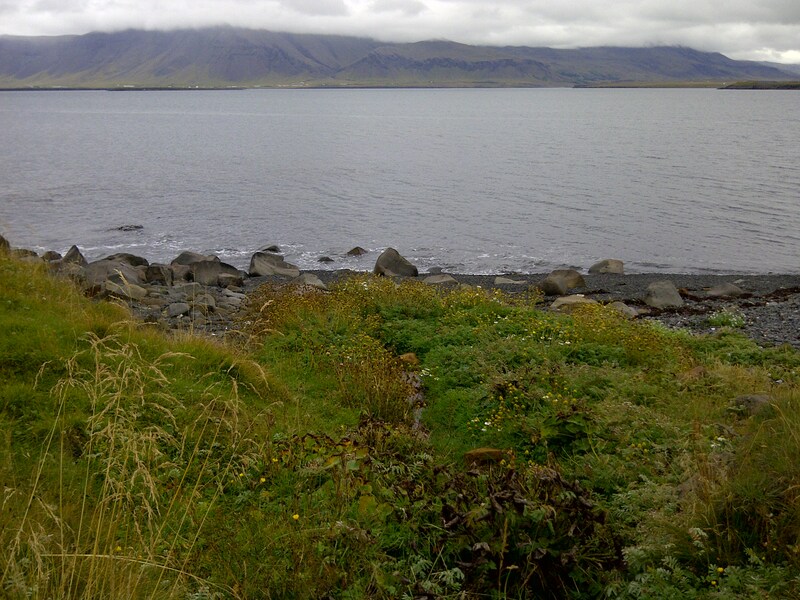 This entry was posted in Religious Heritage, Spiritual Life, The Temporary & The Enduring and tagged Autumn, Iceland, Momento mori, Travel, Vacation. Bookmark the permalink.